Yes, I know it has been quite some time since I've posted an entry. No excuses but I'll try to do better. 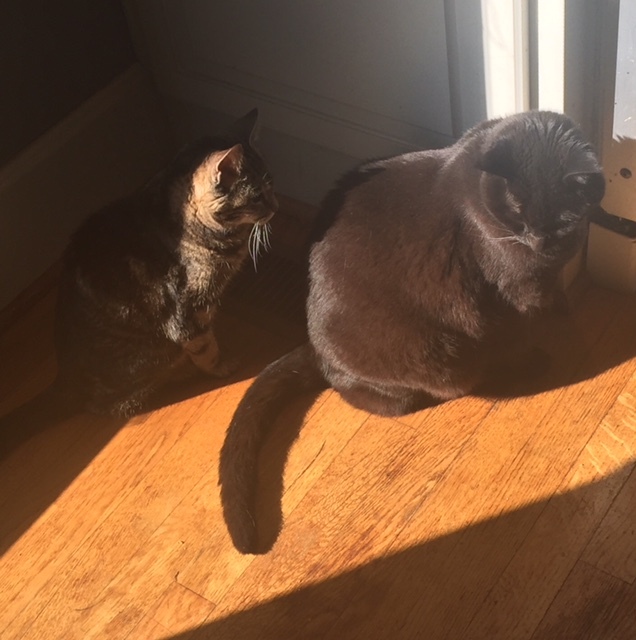 I did receive quite a few lessons and despite my general laziness in doing blog entries, I managed to review them all the day I received them. A reminder...For my non-US students, I will no longer send back the swatches after each lesson. Postage is just too high and I don't want to increase the cost of the course. What I have been doing is photographing areas of swatches that need special attention. I think this will work. This week's tip was prompted by questions from several students. In Lesson 2 of the Basics course covers different types of decreases with an emphasis on mirroring them. 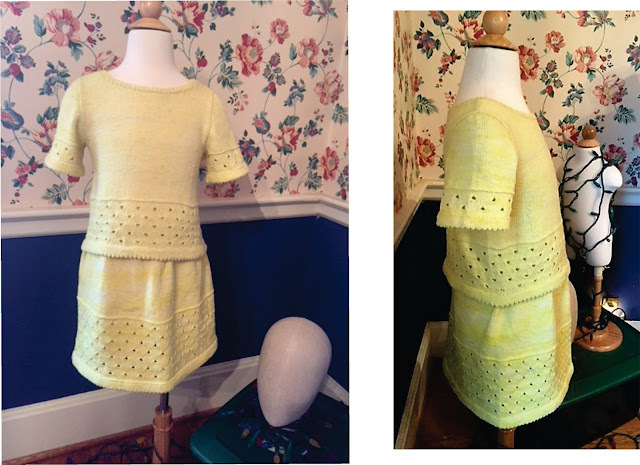 If you are an experienced knitter mirroring isn't big news but for new knitters, thanks to the way patterns are written it can be new information. The way most patterns state how to place decreases is part of the problem--"Dec 1 at each neck edge every RS row 3 times". How would you know not to place the decrease in the selvedge stitch and that there are other decreases than k2tog. A is a properly worked SSK where the stitches are slipped knitwise to the other needle to ensure that they won't be twisted. Care was taken not to stretch out the looks. Notice that the stitch on top is open at the bottom as is the stitch underneath. B is a k2tog tbl (two stitches knit together through the back loop). Another way to look at this is an SSK where the stitches haven't been slipped. 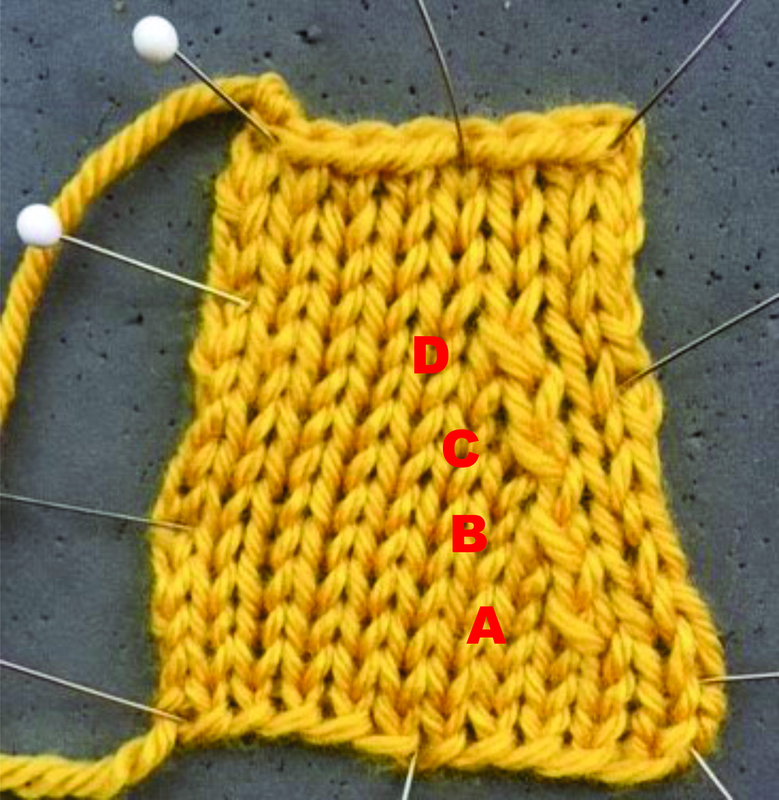 Compare A and B and you can see that both stitches in B are twisted at the base. Twisted stitches are more noticeable and don't mirror k2tog decreases. D is an SSK where only the top stitch is slipped. I've had several students tell me that they are sure I haven't seen this before since it is so marvelous a solution to oversized SSK decreases. Nope. I'm aware of this decrease technique. Compare A and D and see if you can spot the difference. If you don't slip both stitches, the stitch underneath is twisted and yes, this does change the appearance of the decrease. Feel free to use this technique in your own projects any time but if you are doing the Masters Program, you will be expected to produce an SSK without any of the stitches twisted. Actually I don't feel too bad about not making a posting after I looked at all of the knitting I've been doing. Between holiday/birthday projects and things for Cast On, I've been busy. By the way, I learned the hard way this year when I was trying to figure out what I'd given for gifts last year . I didn't put them in my blog--hence the number of photos this year. I did take a photo of the first thing I did for the Spring issue and posted it in my last entry. This is a hoodie knit with Mondo Fil yarns. One is a cotton strand and the other is a metallic. The drape of this is really amazing, sort of like light weight chain mail. It is called the Rose Gold Hoodie. The hood is oversized so that it drapes nicely on the shoulders when not worn. Socks with zig zag pattern (which I love). My sister and my niece and nephew all wanted hats, in gray. The first one has a cabled cuff and the last one has a sawtooth boarder and yes, there are lights around the mannequin head which I've named Anne Boleyn. I made several pairs of texting gloves (and I still have to do a few more pairs). I kept one of the pairs I knit for the Fall 2017 issue of Cast On and I have to say, they do keep my hands warm. When I walked to Starbucks this morning it was 9 degrees.